Rob Ryan is British visual artist, paper cutter, illustrator and screen printer. He is famous for his commissions for Vogue, Elle, Waitrose and Urban Outfitters. His delicate paper cuttings are printed onto a range of beautiful home wares and into incredibly detailed books. I'm lusting after all of his intricate designs! Who doesn't love bunting, and especially in gorgeous pastel colours, with a pretty design? Its just a shame its so expensive- but still can't stop me lusting after it! A beautiful, handcrafted book. Each page is a unique paper cut illustration with a little motivational story about thoughts and dreams, loneliness and longing, the personal and the universal. Too cute. These gorgeous mugs don't make sense unless they are next to each other. I think that idea is completely perfect! When I first saw these in Urban Outfitters, I picked up one mug and couldn't make sense of it, until Poppy, my friend, picked up the second one and we realised they go together. The colours and illustration on this money box actually makes me WANT to save! A money box that can do that, has got to be worth almost 20 pounds.. right? This duck egg blue pillow is covered in bells and birds and my are they sweet. Rob Ryan is the king of beautiful print ideas. I just love the words on this bag: 'You can still do a lot with a small brain.' So sweet and the little birds with the thread remind me of Cinderella. 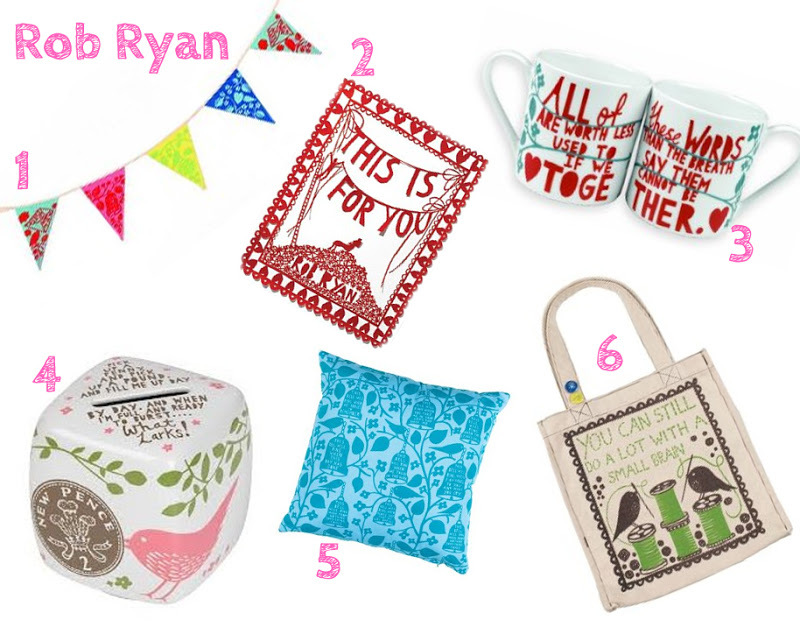 Are you a Rob Ryan fan?